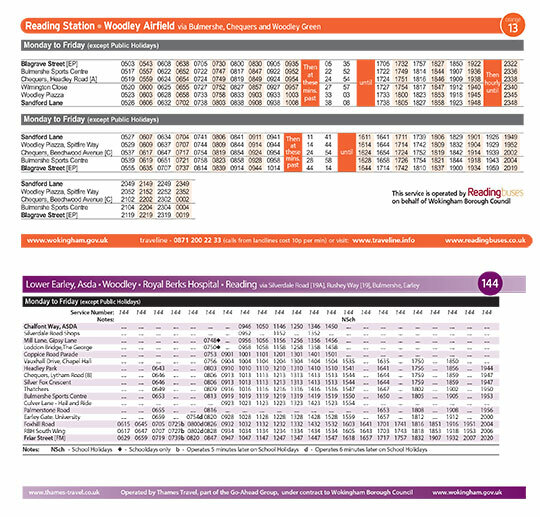 Pindar Creative is a market leader in producing bespoke timetable publications for the passenger transport industry. We are able to produce timetable page content from a wide range of data formats, including RTF, CIF and XML files. This avoids the process of re-keying, which in turn improves accuracy and eliminates the duplication of data input. This facility in conjunction with our very latest AppleMac computers and software packages helps increase the accuracy of content and the speed at which timetable publications can be produced, from the supply of your original data to delivery of the final printed publication. Wokingham Borough Council recently approached Pindar Creative to find a solution to reduce the need for them to re-key timetable data for their series of three local travel guides. Wokingham were able to provide a data export from ‘Omnitimes' in RTF format. Pindar Creative was able to import the data into our desktop publishing software to style and subsequently generate the final timetable pages. To compliment the timetable page sections of the guides, comprehensive informative page content as well as cover panels were styled from scratch and produced. All were branded clearly in line with the client's requirements.